The African Storybook (ASb) visit to Nigeria to facilitate the quality assurance of the Hausa storybooks on the website was a follow-up workshop to one that Tony Lelliott held in Abuja in May, 2017. Its purpose was two-fold: to introduce the initiative, storybooks and website tools for translation and adaptation to college lecturers from Katsina, Jigawa and Zamfara states, and State School Improvement Team (SSIT) from Jigawa state and to carry out editiorial quality assurance of storybooks translated into Nigerian Hausa. Tony Lelliott and Dorcas Wephukulu facilitated the process. It was a very successful visit. We held a two and half day workshop for nine college lecturers from the aforementioned colleges and the State School Improvement Team. The group started off by translating into Hausa (Nigeria) Africa unity race, Kalabushe the talkative, Two little friends, Big blue bus and Byantaka and the dead pot. Each of these storybooks was edited and quality assured by a different group and approved except Two little friends. Although participants worked in pairs, it was a consultative process with often one pair checking out something with another across the table. From time to time, spontaneous discussions involving the whole team were held to reach consensus. Before the workshop, there were 46 Hausa (Nigeria) storybooks on the website none of which was ASb approved. Our analysis showed that seven titles were duplicates, 11 had been translated from unapproved storybooks and three had been created in Hausa. 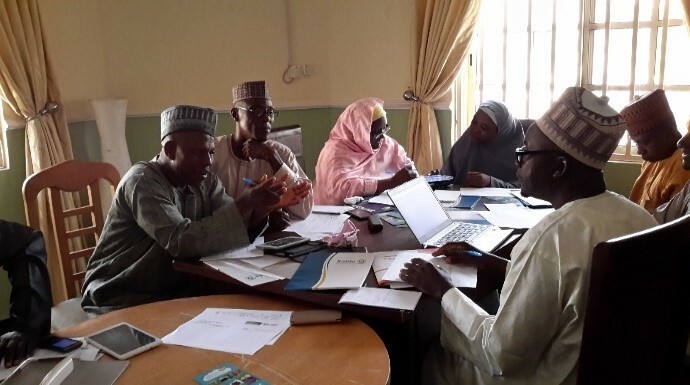 The goal of the workshop was to have between 30 and 35 storybooks quality assured and approved by the end of the workshop and to have a team in place who would take charge of future ongoing quality assurance and approval of Hausa storybooks on the website. The team managed to quality assure the 25 of the 46 that had been translated from approved ones as well as four of the ones they translated on that day. They also quality assured one Hausa created storybook. By the end of the workshop, we had 30 Hausa (Nigeria) ASb storybooks approved. Here is a link to one of the approved storybooks for our Hausa experts to comment on. Three people were chosen to take forward the process of quality assurance which includes working to get the Hausa special characters inserted in the approved storybooks. They also have approval rights of Hausa translations and created storybooks on the website. All participants were registered on the website and can edit their own storybooks. The Nigeria Educational Research Development Council (NERDC) is responsible for the Nigerian school curriculum, and other development organisations implementing literacy initiatives in Nigeria. We managed to hold very productive meetings with their Head of English for Education Systems Southern Africa and Nigeria at the British Council and the Literacy Coordinator from Reading and Numeracy Activity (RANA). All the discussions centred on how we can collaborate not only in Nigeria but eleswhere in Africa.